Into the blind world of IT costing we have now descended. Having learned about bean counting in our last journal, we delve deeper.Abandon me not! Rather, let me be your guide on this prickly journey. Together, we will debase more metaphors and dissever the anatomy of enlightened IT Service Costing. Services are at the center, at the heart, of IT Service Costing. ITIL defines services as a means of delivering value to customers by facilitating outcomes that customers want to achieve without the ownership of specific costs and risks. Just leave it to the architects of ITIL, those purveyors of linguistic magniloquence, to turn a simple concept into a fustian phrase. In everyday language, services are what IT provides that helps business employees get their jobs done. Or, to borrow an analogy from my colleague Erika, think of the difference between buying food at a grocery store and eating at a restaurant. You can buy food at both places, but the restaurant lets you order from a menu, serves the food to you, has tables, glasses, silverware, and ambiance (we hope). (see What Makes Something a Service) Consider an IT example. The customer may want to be able to communicate with somebody else remotely using their voice (the outcome). From an IT perspective, there are multiple ways to accomplish this: landline telephone, mobile telephone, conference calling, internet telephony, voice chat. IT could address this need by creating a Voice Communications Service with landline telephone, mobile telephone, conference calling, etc. as service offerings. If services are the heart of IT, then how come so few IT organizations define them? “Because its hard” is probably too coy an answer, though it is largely true. For services to be easy to understand and useful, they need to be defined not from an IT perspective but from a business perspective. Focus on what the business needs and how the business defines outcome. This is something that IT Finance cannot accomplish alone. Nor can IT speak for the business customer. Defining a service is a collaborative effort that must involve the business customer and IT. 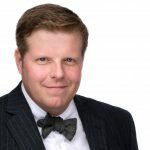 IT Finance is often a valuable stakeholder because one of the defining characteristics of a service is that a customer is willing to pay for it. IT Finance is concerned with charging a fair amount for the service, one that encourages business customers to use services judiciously. Far from being an academic exercise, defining services has at least three primary benefits. First, it helps IT to understand what the business really wants and shows the business that IT has value. Second, it sets the stage for creating a catalog to advertise services to customers. Third (and the subject of our inquiry), it is a precondition for IT Finance to document value, aggregate costs in a way that the business can understand, and establish chargeback models. It is a good practice to define all your services – those that support your internal business outcomes, those that are needed to support IT-specific outcomes, and for IT shops that provide services outside of the organization, those that support external customers. However, in terms of service costing, it is best to focus only on the IT services that support your vital business services. Vital Business Services are those so critical to your organization that if they experience an interruption or severe degradation, your business cannot operate or will suffer a significant blow to its reputation. Vital business services support the core services your organization provides. For a hospital, this could be the IT services that support electronic patient records. In a university setting, this could be the IT services that enable the online course management system. For a managed service provider, it makes sense to perform service costing on the most valuable customer offerings so you can determine pricing. Performing service costing can be time-consuming and costly. Few organizations have the expertise or the time to do this on their own and hire a consultant to make the process more effective and efficient. Defining and costing vital business services allows you to invest time and money where you will get the greatest benefit in the shortest amount of time. You will need to determine at what point the value of the information you obtain from a service costing exercise is worth the investment. It is not necessary to reach a level of scientific precision for every service. Ready to take this a step further? Start laying the groundwork for your future IT Costing endeavors with our free templates! The Backbone of IT Service Costing is made up of the hardware, software, and infrastructure components needed to deliver the service and all associated service offerings. We need to identify all the direct and underlying components associated with our services. Take our landline telephone service offering as an example. 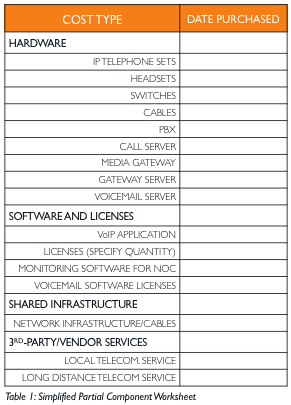 To deliver land-line voice to customers, some typical components are required. These could include IP telephone sets, analog telephone sets, various types of headsets, VoIP application, licenses, switches, cabling, PBXs, monitoring software for the Telecom. network operations center, call server, media gateway, and trunks. What about voicemail? Should the associated hardware and software be included as part of the land-line telephone service offering or accounted for separately? To answer this question, it helps us to think about the concept of core, enabling and enhancing services. Core Services are the minimum services you provide to fulfill the customer need. In our example, the ability to speak over a landline telephone is a core service. Enabling Services are services that support the core service. Normally the customer does not see or care about the enabling services. But in many situations, you require the enabling services to deliver the core service. For example, to deliver landline telephone service, we need the telecommunications network facilities and any underlying infrastructure. Enhancing Services make our core service offerings sweeter. They help to differentiate us from competitors. Voicemail could be considered either enhancing or core. If voicemail is an optional feature for which you charge extra, you might consider it an enhancing service. You may also think of voicemail as something that comes standard with the landline telephone service offering. In that case, it would be part of a core service. Regardless of the route you take, the components of voicemail should be counted as part of your larger Telecommunications Services. Components and infrastructure that are shared by more than one service present additional complexity. To continue our telecommunications example, compiling a component inventory was relatively simple in the days of “plain old telephone service.” There were telephones, cables, and lines dedicated to voice communications. Even in the early days of PBX telephony, components were fairly straightforward since telephone equipment and access to the network was largely segregated from other components and infrastructure. As IP telephony has evolved, increasingly telecommunications shares infrastructure with the data network. Many organizations fail to address shared infrastructure at all, which culminates in an artificially low service cost. Other organizations “double count” the cost of shared infrastructure by allocating all of it to one service. Another common approach is to lump all shared infrastructure into one bucket. There is some logic to this simple solution, but the drawback is that it is hard to control costs for anything in the “other bucket.” And the tendency is for the “other bucket” to grow and grow. Perhaps the best way to address shared infrastructure is by heuristically allocating a percent of it to particular services. Although this “gut feeling” approach lacks scientific precision, it is often good enough to capture cost and minimize the additional effort and expense it would take to derive a more accurate estimate. As we build out the component worksheet, we add a column to indicate what percent of a component is allocated to the service in question. The discerning reader may wonder why we tarry so long in the dismal limbo of IT component costing. Is it not easy to count the beans? Just tell that to anybody who has been assigned the enjoyable task of auditing telecommunications user licenses and tracing them back to a PBX. Or to the hapless bean-counter, the IT neophyte who has vainly attempted to figure out how to allocate a server back to ten different applications that are running on it. Be not afraid! It gets better. The components for some services are easy to count. This is especially true of those that we deliver to our customers via third-party vendors. For example, there may be no hardware or software components to count for a third-party teleconferencing service. This does not mean that there is no cost associated with the service; but it is easier to count since we can look at the vendor invoice and account for a few of our employees who interface with the vendor when there is an issue. Dear reader, how we have dawdled, muddled through the thorny patches! In our next peregrination, we will continue our autopsy of service costing and learn about the hands and blood of IT services – the people that make it all possible. Stay tuned for the third and fourth partitions of Beyond Beans: the Anatomy of Enlightened IT Service Costing. 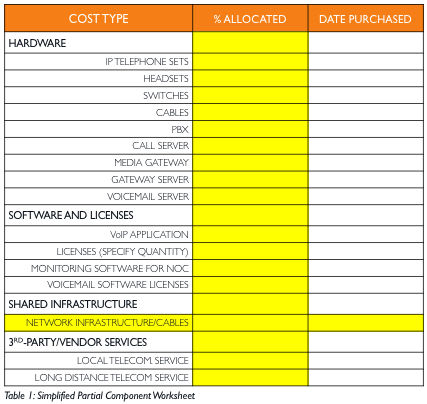 Be sure to check out our IT Service Costing Guide!